This weekend we have an open house showing on Saturday, November 19th in Cimarrone Golf & CC. Please come by and tour this beautiful home. There is a wonderful agent available to assist you and answer any questions you may have. 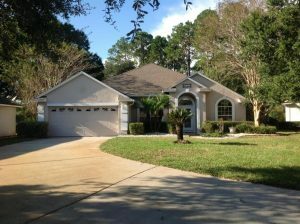 Come to one of the beautiful gated community on CR210, enjoy golf all around the year. 3 Bedrooms 2 bathromms,ready to move in. Lots of natural light and open and spacious floor plan. Kitchen w/42” cabinets overlooks eat-in nook and great room. Separated dining room and library/den gives you extra. Walk out to a screened lanai and Jump into the in ground pool. Enjoy the Florida life style. Top rated school system in St Johns County! Contact Gabriella Marichal for more information!